The commissary. The place Americans in Addis love to hate. US embassies around the world run commissaries for their employees. These places are shops, usually on embassy grounds, offering American consumer goods (food, toiletries, and alcohol) for sale to soldiers, embassy workers, and diplomats stationed overseas. Can’t live without Fritos, Kraft mac & cheese, and Snickers bars? The commissary promises to make you feel like you never left Medford. You can even pay in US dollars with cash, check, or credit card. The commissary exists to serve US government employees. In some countries, especially in the developing world, it also offers membership to certain other American expats. The countries where they do this are called “hardship posts” because you know how hard it is to survive without Skippy creamy peanut butter. Our school in Damascus was affiliated with the US embassy and the commissary had for many years been open to DCS teachers. But the embassy there was downsizing to essential personnel at the time we arrived, and the commissary shut down before I ever even saw it. We probably wouldn’t have joined anyway. There were very few items I consider necessary that we couldn’t find at the store. Some items not sold in the supermarkets (bacon, for example) could be special-ordered through a Christian-owned neighborhood shop whose driver made weekly supply runs to Lebanon. Here in Ethiopia, western goods are much harder to come by. Baking supplies like chocolate and brown sugar are simply nonexistent, and some items like nuts and dried fruit command absurd prices (eight dollars for six walnuts, in the shell?). Also, the local lamb and beef are very tough – fine for the stewed wats that are central to Ethiopian cuisine, but less satisfactory for barbecue or roasting. In the fall, overseas-hired ICS teachers with US passports received invitations to join the Addis commissary. For $125 per family per year, we have access to all the potato chips and Campbell’s soup our American dollars can buy. They also sell Kenyan beef, lamb, and pork that is similar to American meat. Unfortunately for us, teachers are barred from purchasing alcohol at American commissaries. Sheesh. I read that Senator Orrin Hatch was responsible for adding this moral turpitude restriction via a rider to some unrelated bill. I can’t find a reliable reference to the law’s origin on the internet, and its authorship may just be a rumor. Whoever it is that’s responsible for this nonsense, chances are I wouldn’t have voted for him anyway. 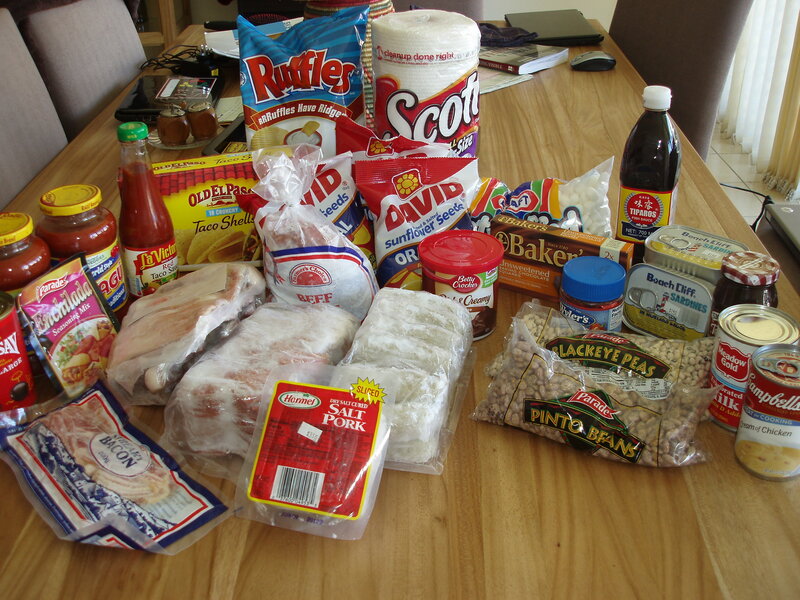 Some members, especially the long-term expats, gripe about the commissary. There’s a lot of talk about how the store used to offer more variety, more desirable items, and more stock: shelves of popular items are often bare, and there is a lot of hoarding going on. A common complaint among teachers is that there is too much shelf space allotted to the liquor section, but I suspect they might feel differently if that area wasn’t off-limits. Sour grapes in the wine department. Despite the negatives, I joined. And look at all the goodies I came home with from our first shopping trip. Sadly, no Twinkies, not anymore…. This entry was posted in Addis Ababa, Expat experience, Food, Shopping. Bookmark the permalink.